Welcome to your ultimate kosher information guide, from the Atlanta Kashrus Commission. We’re the biggest kosher certification agency in the southeastern United States, having certified brands like Kroger, Trader Joe’s, and Sysco. Kashrus agencies like the OU, OK and Star K depend on us to be their eyes and ears in the deep south. If you’re looking for a regional kosher certification with international reach, we offer you the perfect blend of easy oversight, competitive rates and wide approval. Apply for certification now! Kosher is a biblical term that means “fit” or “proper.” Its most common usage is to denote the types of foods permitted to eat according to Jewish Law. Over time, it has been incorporated into daily vernacular to mean that something is genuine, legitimate, or official. One of the myths about kosher certification is that the process consists of a rabbi blessing the food. That’s not what happens. In fact, kosher laws are a clearly defined and immutable body of laws about what foods conform to a set of dietary specifications. The sources for the kosher laws are Biblical, and further explained in rabbinic legislation. Included in these specifications are: what animals, fish, and birds may be prepared for consumption, the methods of preparing and processing them, the prohibition of mixing meat and dairy products. Given the complex and extensive nature of these laws, it is necessary for those who observe these them to rely on certification from an accredited rabbinic organization. When a rabbi visits a kosher facility, he is insuring that the items produced there meet kosher requirements. Is it worth becoming kosher? 150 of our clients think so - Click here to see a list of the companies we certify. Keep reading and get the facts about why more businesses than ever are considering kosher an essential part of their manufacturing and brand identity...both big and small companies...both industrial and consumer product manufacturers. According to the kosher stats from Lubicom Marketing, the kosher market is worth $12.5 billion. Driving this share are 12.3 million kosher consumers in the United States alone, and 35 million non-Jewish consumers worldwide. When you go kosher, you’re adding your product to a market of over 19 thousand kosher products from nearly 12 thousand plants and companies. When you place a certified symbol on your product and put it head to head with a non-kosher product, the kosher product sells faster by up to 20 percent. Scrutiny during processing leads to greater peace of mind at the shelf. A kosher product is widely considered to be of higher quality, and is safer for people with allergies. Jewish people who need to adhere to their religious standards. Muslims who observe Halal dietary requirements. People who want more proof their products are high-standard, healthy and safe to consume. Anyone who is lactose intolerant and requires non-dairy goods. Vegetarians and vegans often seek out kosher products that are positively meat or dairy free. Then there’s religion - not just Jewish people require higher standards on their products. Twenty percent of the world’s population are able to satisfy religious dictates on their products with kosher supervision. Many consumers in today’s marketplace are more likely to make healthy and wholesome choices when the option is available. A sure way into this lucrative market is through kosher supervision. When you choose the AKC designation, you can easily cater to the large market segment that prefers a kosher symbol. Our experts will help you get the most out of your new certification. Once you produce a kosher product you can explain this in your advertising and appear in new venues. WIth the right marketing you will not only reap a great return on investment, you will get mindshare in new markets. 8% - looking for vegetarian products, either for religious or dietary reasons. What Markets Do We Certify? The best question is what markets do we not certify. Odds are, your product is one that we already cover. We have hundreds of companies in every niche - from agriculture to silver polish and packaging. What is the Difference between Meat, Dairy and Parve Foods? Many kosher laws stem from whether a food or food derivative falls into one of these categories. Because of the strict limits set down by kosher laws, consumers have peace of mind that a kosher certified dairy product contains no meat, and vice-versa. Parve products must contain neither meat nor dairy ingredients. What is Considered Kosher Meat? Any meat or derivative will be given a ‘meat’ designation. The meat must come from an animal that both chews its cud and has split hooves. Many large domestic animals are kosher. Common kosher animals include cows, sheep and goats. However pigs, which have split hooves but do not chew cud, aren’t kosher. Neither are camels, rabbits or frogs - just to name a few. There is a distinction between meat from large animals and from birds. Most fowl that are regularly eaten in the West are also kosher. This includes chicken, turkey, geese, duck and game hens. Birds of prey are never kosher. All animals must be slaughtered by a Jewish expert called a shochet, in a specified manner using a long razor sharp knife. No blood may be eaten so meat is soaked and salted prior to being packed for consumers. Raw eggs that are used in production must be inspected to ensure there are no blood spots inside. Certain hind-quarter fats are not kosher. These sections must be removed. Not only must the meat be kosher and properly prepared, it also needs to be cleaned and packed with kosher utensils. Any milk ingredient that finds its way into a product renders it ‘dairy.’ This means that milk, cheese, butter and sour cream or yogurt are all dairy products. To be kosher, the dairy product must come from a kosher species. It cannot contain any meat product, such as rennet. The equipment used to process the ingredients must itself be kosher. Parve refers to any food that is neither milk nor meat. It may be used in any milk or meat production, this includes fruits, vegetables, pasta, bread, eggs, coffee, tea and most spices. To be certified as parve, the product often must be processed on equipment that is neither dairy nor meat. Anything that is itself meat or dairy will render the parve product meat or dairy. Fish, though parve, has it’s own surprising stringency - it cannot be mixed with meat. So bread that is made with omega fish oils cannot be used to wrap a deli sandwich. Kosher certification requires there be no apparent insects or insect eggs present in a product. Many fruits and vegetables are common hosts to a variety of insects, and they must be washed, sometimes repeatedly, and checked. No! Shellfish are not kosher. And neither is shark or any undersea creature that doesn’t have both fins and scales. Common fish such as tuna, salmon and trout are kosher. Nothing is more stringent in kashrus than wine. It requires the full participation of Torah observant Jews to prepare, regardless of the status of the ingredients used. People respond to a certificate of kashrus a bit like the diploma on the wall of their doctor’s office. It makes consumers feel more confidence in you and your product. Once your business or product is certified, you will be given a letter of certification that you may display on premises to let people know that you are a kosher establishment. You may also display the AKC symbol on your products and marketing material. 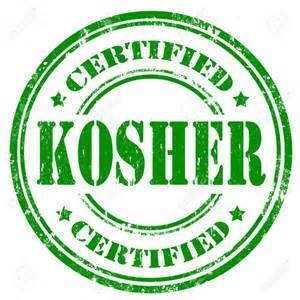 We make becoming kosher certified as easy as possible. You can call the AKC for a free consultation and speak with a specialist to discuss options and feasibility. Every industry is different, and comes with its own requirements to achieve a kosher designation. In some cases the ingredients may be sent to the AKC and we can do much of the work off-site. In other cases we will conduct in-depth inspection to ensure everything is kosher. All certifications typically require a site visit to establish a valid kashrus status. Once you’ve decided to move forward with certification, send us your completed application, which will give us a good understanding of what may be involved in making your product or plant kosher. The application includes information on what is produced by your company, as well as a thorough list of ingredients and processing agents, including those for which certification is not being applied. If certain items on those lists are already certified kosher, enclose kosher certification letters for those items. A travel and initial inspection fee may be required. Ingredients and processes will be handled in strict confidence. Once the application has been received, the AKC will review the application and discuss all aspects of the kosher requirements for the facility. Each area of kashrus has its specialist, and we will team your company representative with our rabbinic expert in your field. Before rendering a decision based on data or ingredients alone, our rabbinic expert will visit your facility and learn how you manufacture your product. Here is where the rubber meets the road -- An analysis will be made to determine how frequently a local Rabbi must visit the production facility and what steps need to be taken to make the plant kosher. We’ll advise you on any changes that need to be made while maintaining the integrity of your process and product. Potential fees will be reviewed and approved beforehand. The AKC mails a contract if it is determined that the plant can meet our requirements for kosher certification. The contract will include all kosher requirements and any applicable fees. Some certification fees are as low as $100 a month. The fee depends on the complexity of the facility, the number of products certified, location and travel costs, and the number of visits required. AKC certification fees are some of the lowest in the kashruth industry. They are typically 30% to 50% less than some of the other national certifications. An official Kosher Certification Letter is granted upon receipt of a signed contract and payment, and when all of the stipulations of the contract are met. This then entitles the plant to include a registered symbol of the AKC on any products or facilities certified in the letter and to advertise that these products are certified kosher. What Does it Take to Be Kosher Certified? Every business is a little different, but generally your organization must be willing to work with the representative of the AKC, both via phone, email and during live inspections. There may be changes recommended to your product or your manufacturing process to ensure there isn’t a non-kosher ingredient, or a mixture of meat and milk. These are very general ideas as the kosher laws themselves are quite extensive. Even a person knowledgeable about kosher laws will only have a surface understanding when it comes to assessing the kashrus of a modern product or facility. Our experts have such an intricate knowledge--they can help certain plants and products attain fully accepted kosher status that a layman would assume cannot be kosher. Why are our fees lower? We’re not a business, we’re a small and agile organization. If you have any question about fees, please let us know and we’ll do everything we can to help you get your business kosher. We don’t pin our rates on the size of your company, to the sales that you make, or the value of your products. We’re more than competitive - we’re undercutting the big guys because we can. That being said, our rates will depend on how intensive the certification requirements are. Your kosher program will be designed with a number of audits that are both in-person and off-site. The frequency of these audits will differ depending on what you manufacture and how. Other variables that affect the fee include how easily we can get our certification agent to where you are located. What we want are more companies producing more kosher products, because that helps everybody. These requirements will vary depending on the industry. For example, honey is naturally kosher; however there is much certified honey, which ensures that a non-kosher element hasn’t been introduced into the process. Every product is different, and requires the AKC Rabbis to discover just what the issues are. However, this is isn’t happening from scratch - there are best practices according to the industry, and our rabbis are careful of your time and quickly reach decisions, much as a food safety inspector would. Why is it that you can find the AKC symbol on shelves in Florida and also all the way to California? Any food or product that has attained a kosher certification is eligible to display the symbol of the certifying agency. There are a dizzying number of agencies. A handful of them are large, national certifiers with global reach. Others, such as the AKC, work regionally but still enjoy national recognition. In the Jewish world, the kosher symbol is called a ‘hechsher.’ Kosher consumers in this market will either already be aware of the standards of a certain hechsher, or actively seek current information about the organization’s kosher standing. When you choose the AKC symbol, you’re getting a fully accepted and mainstream kashrus certification trusted by the biggest names and largest Jewish markets -- plus you’re getting it at a regional price. Rabbi Shkarofsky is the AKC Industrial Kashrus expert. He lived for 5 years in Mexico City where he was involved full-time in advanced Jewish learning. He returned to the United States, where he took a position through Rabbi Nota Greenblatt with the Orthodox Union in Memphis. “It was a serious kashrus job”, says Rabbi Shkarofsky. “Many times when I go around with a quality assurance manager, they appreciate the opportunity to walk around both the production floor and warehouses because usually they’re in the office dealing with samples and requests. They don’t get enough of a chance to make sure there aren’t broken pallets, a leaky drum that needs attention or something that nobody wanted to report. “My contact while I’m checking labels...he’s taking pictures of things that are not good GMP and he’s calling on his cell phone to fix this thing that was put in the wrong place, or this allergen that is in the wrong place, or some container that is leaking and not safe for the forklifts. “They appreciate being able to walk around the plant. While I’m checking my regulations they’re checking their regulations at the same time. Sometimes our regulations alert them to overlapping things we both care about. Some things we care about in kashrus are also helping them do their jobs. "But even if someone were to suspect otherwise - we’re not a government safety inspector. If everything is good - you’re good. If you’re not in compliance of kosher there is nothing to be concerned about. We can help you fix that. We’re just there to monitor and advise, not to penalize." What Are Kosher Issues In an Industrial Plant? “We don’t make decisions based on suspicion of what happened in the past. But once there is something wrong, a red flag, we have to be concerned with what happened previously. “With industrial manufacturing they always make the same items, and we know exactly the ingredients that are supposed to go into them. So if there is a foreign ingredient, even if the foreign ingredient is kosher, we have a question about why it’s there. How did it get in? Alternatively, if an ingredient is supposed to be there and it isn’t, we have a question about why it’s not there. What Is the Industrial Kosher Assessment Process? “It’s pretty standardized. We look at records. Everything has a receiving record. We’re just verifying that it is kosher and we’re going to monitor and maintain it as a kosher with our visits. But we still have a question about the history; we try to get a paper trail. “We look at batch production sheets which tell us what ingredients are going into the product. At the outset we don’t care about the percentages - that’s the company’s sensitive information. We just need to know what the ingredients are and where they came from. “However, if we find a problematic ingredient, then we will ask for the percentages, but we don’t do that before we find a problem. “We try to do our visits as quickly as possible. The typical visit takes no more than 45 minutes. “When a company introduces a new product or part, we have approval sheets. We’re more than inspection - we’re in communication constantly - we’re a kosher consultant and advisor. What Happens When Something in the Plant Isn’t Kosher? “Most of our companies have to do very little to become kosher,” says Rabbi Shkarofsky. “The most common thing that has to be done is to change a vendor on one or two ingredients. It’s usually not a big deal. They may even be getting it from a generic brand. “Many times it’s a question of whether they have to sterilize or do a boil out on one piece of equipment. Maybe an oven has to be burnt out. We have them fill it up with water and boil it. If it’s an oven we have them turn it on to the highest safe temperature and let it run for an hour. If it’s a pasteurizer we have them use a sanitation run on the maximum temperature just because there is a question about the history of what the equipment is used for. Especially if the equipment was bought used. “My whole training was in chemicals. We do a lot of different chemical manufacturing facilities. Chemicals, meaning not only flavors manufacturing. We do different chemicals that are additives. Food grade defoamers, release agents, esters and polymers, dispersion agents, lubricant additives. We do a lot of other manufacturing - both chemicals that are additives to different processes. We certify the companies Arylessence, and GSB & Associates - two big flavor manufacturers. “Sometimes what we certify is more of industrial repacking. The company is buying an already kosher material in bulk and selling it in smaller sizes to companies that can’t afford to buy in huge quantities. They’re relabeling the product with their own name - they’re a distributer. When a distributor sells products with their own name, they need certification. “We certify a lot of cleaning chemicals used for cleaning industrial food grade equipment. Our companies include Solvay, Zep, Afco, Chemstar, Momar and Midlab. “These go into food and require kashering of the equipment. Typically it’s just a standard cleanout, the kind they would do for their own purposes. Maybe the temperature, water level or duration of time will vary. Polymer, Cleaning Chemicals for Food Grade Equipment. “We don’t require a formal kosherization on the equipment. Because these machines involve ‘incidental contact’ with food, so we’re not concerned about non-kosher products being made on the same equipment as long as there is a sufficient surface cleanout. We’re also not worried about the history of the equipment as long as it has had a surface clean. “The AKC is lenient because most of these polymers are not an edible product. It’s not safe for human consumption. We’re just certifying there are no animal components that would render the equipment non-kosher." "I’m the new guy. I’ll be starting my 18th year in September. I like serving the community both locally and broadly; some of what I do goes international. It’s amazing to think about, something I’m doing someone in another country is relying on. "Part of what I enjoy is being out and going around to places. Even on some of the most boring roads, the scenery is better than in the nicest cubicle. The places I go are fascinating. I’m paid to go into places and learn how things are made. A lot of kids like to watch things being built and made, and now I’m just an adult kid who likes to watch things being built and made. "But I’m also a partner. So, I’m part of it." "On the food service side, I’ll do a reception dinner for 600 people in a non-kosher hotel. It takes a lot of focus and awareness to know what is going on - to know what is kosher, what is not and where it is at every moment. "It’s something I always knew but never verbalized that way." "If I had to guess, two-thirds of my time is commercial hashgacha, or factory work. That may involve kashering, special productions or routine inspections to verify they’re maintaining their kosher standards. Within that there is also the record keeping, paperwork and filing reports. "Initially, it sounds like I’m a police officer. The other quarter of my job is percent - food service." "You probably had lunch today, and you’ll probably have it again tomorrow. It’s interesting that in the food industry some sections are less recession sensitive. We’re not recession proof, but some of our businesses are less recession sensitive because when the economy stops people keep eating. "Even if you skip a meal, you’re not going to make the kids do that. "Take a candy factory. When the economy is going down their business is going up. People cut back on things they need, the big stuff. But they’ll make up for it by buying a dollar bag of candy at a time that other businesses are going out of business." What is a Rabbinic Field Rep? He makes sure the factories are compliant, reporting to someone in the office called a Rabbinic Coordinator. Norman Schloss is our field rep for the Orthodox Union, and each representative may be responsible for around 200 companies. "It sounds like it’s an immense undertaking, but there’s not that much they have to put their finger on every single day. They’re relying very heavily that we in the field are doing our jobs. "So Rabbi Shkarofsky is the rabbinic coordinator for all the Atlanta Kashrus Commission companies. "I have to ascertain that all of the ingredients are kosher for all of our AKC companies. That means making sure that all of the ingredients are re-certified by the supplier, and that the schedule is maintained. "One ingredient may cross over 17 other companies. So to do my job properly, I need the most up to date schedule of ingredients." "At the AKC we offer lower overhead, quicker response and better replies to email. At the office I’m never more than four feet away from the decision maker, which is a luxury that OU field reps don’t have. At the AKC we’re together on a weekly basis. "By comparison, when I’ve been the field rep for some national kashrus organizations, there are rabbinic coordinators who I’ve never met, spoken to or communicated with, and these are my liaison to the agency. "Part of the reason for this distance is because there are no problems, which is a good thing. Another is that different organizations work differently. For example, I started working with a new rabbi at a national kashrus agency and we spoke several times before I visited each plant. I learned what he wanted and his concerns. "On one hand it was his personality. But also the kashrus organizations have personalities." "We do benefit tremendously from our relationship with the nationals. We get exposure to industries we might not otherwise see; Heinz wouldn’t call me to go into their factory, but the OU calls me to go into Heinz." We have access to the OU’s experience and their research. When we began certifying brewers, we didn’t know what the ramifications of ingredients like milk are for kashrus. Actually, part of it we knew, because it’s standard. But the part we didn’t know was how to deal with the fermentation or carbonating vessels. Rabbi Shkarofsky spoke with Eli Gerstner in the OU, who spoke with someone who could do the calculations. Some vessels needed one thing, others needed something else, and the mathematics wasn’t simple. In the end we discovered that any kosher concerns didn’t impact the vessels or the boiler system. Without access to the national resources, we could have fixed everything with a lot of expense. Instead we were able to leave the hardware alone and still offer a simple certification process. When we did Krispy Kreme, we learned the company had once used animal based shortening. So here’s a kashrus question - how do you certify them when ten years ago they used something that isn’t kosher? Turns out, we measure the volume of non-kosher substance absorbed in the walls of the storage vessel, and again this is a calculation that doesn’t come up very often, and we turned to the OU. They’re okay helping us with this. In fact, people don’t realize how much the OU serve the kashrus world without getting paid for it. It’s part of what they do. There is no secret in how to kosher a 6000 gallon tank. The question is...does it have to be done? And if it does, are there better or easier ways to do it? The answer is extended iruy, which means pouring hot water over the pipe (for a long time). In some places it’s very simple, some places it’s very difficult. How Do You Kosher a Volkswagen? For two years I did a production for the OU, under the agency of the AKC. It was for bread crumb stuffing. After coming out of the oven the crumbs are oiled and go into a tumbler that is held above ground, at an angle, and that weighs more than a VW. It’s too expensive to have a dedicated kosher tumbler. (In fact I know of one other company, and one of the biggest reasons they’re not kosher is because of tumblers and non-kosher seasoning.) But we had to kasher what they had. We took a steam jenny, which is a very hot pressure washer. We turned it on and had it spray in place the rotating tumbler until the outside of it reached the necessary temperature. The average local kashrus agency will never have the experience, the resources and maybe even the knowledge to do this, because it’s the collective knowledge, the experience, of those who work in the large agencies, with whom we work and learn.